Hotel Saint George는 2개의 수영장과 스파 시설을 갖춘 푸른 정원을 자랑합니다. 호텔은 푸에르토 이과수(Puerto Iguazu) 시내 중심가에서 300m, 이과수 폭포(Iguazu Waterfalls)에서 17km 떨어져 있습니다. 파스텔 색상으로 꾸며진 Saint George의 객실은 케이블 TV와 미니바를 갖추고 있습니다. 일부 객실은 정원 전망을 제공합니다. 매일 조식 뷔페로 하루를 시작해 보십시오. 테라스가 마련된 Doña María Restaurant에서는 지역 요리와 세계 각지의 요리를 선보입니다. 수영장 가의 Quincho Bar에서는 프로즌 마가리타(Frozen Margaritas)를 맛보시기 바랍니다. 스파 시설에는 8인용 수압 마사지 욕조, 건식 사우나, 스코틀랜드 샤워 시설이 마련되어 있습니다. 마사지실도 이용 가능하며, 게임실에서 탁구와 테이블 축구 게임을 즐기셔도 좋습니다. Hotel Saint George 바로 맞은편에 있는 버스 정류장에서 버스에 탑승하면, 폭포로 이동이 가능합니다. 아르헨티나(Argentina)의 푸에르토 이과수 국제공항(Puerto Iguazú International Airport)은 19km, 브라질(Brazil)의 포즈 도 이과수 국제공항(Foz do Iguazú International Airport)은 25km 떨어져 있습니다. Saint George Hotel은 인신 매매, 불법 약물 이용 및 고유 문화에 대한 경멸의 표명을 엄금합니다. 이 호텔은 아동 및 청소년의 상업적 또는 성적 착취의 금지 및 근절을 위한 국제 캠페인에 참여하고 있습니다. 따라서, 자녀와 동반하는 투숙객은 가족 관계를 확인할 수 있는 신분증을 지참하셔야 합니다. 본인의 자녀가 아닌 미성년자를 동반하는 경우, 해당 어린이의 부모 또는 보호자의 서명이 날인된 동의서 및 이들의 신분증 사본을 제시해 주십시오. 지방세법에 따라 모든 아르헨티나 시민과 외국인 거주자에게는 21%의 부가세가 부과됩니다. 해외 신용카드, 직불카드 또는 은행 송금으로 결제하는 외국인이 외국 여권 또는 신분증과 이민국에서 발급한 관련 서류를 제출할 경우 숙박 및 조식에 적용되는 21%의 부가세가 면제됩니다. The price is pretty hefty in the area. If I were to compare to the quality of the food, staff and room size and location, it would be deem "reasonable"price. If one is looking for comfort and quality in this area, I strongly recommend this hotel. I missed the stay in Hotel St George cos I wasn't feeling too well and had to miss our domestic flight. It was adequate for a short stay. Located walking distance to the main town centre, and close to the transport hub. We spent most time out at the Falls, so the small, tired room was not an issue. Satisfied overall with my stay. Would recommend this hotel to elderly visitors. It was okay only because it is next to Bus Terminal - very convenient. Big room and clean with all necessary comfortable. Near city center. In overall hotel is quite good but no variety for breakfast. Staff in the restaurant not so friendly. Staff were very helpful, public areas of the hotel very spacious and the breakfast generous. Located across from the bus station with transport to the Iguazu Falls. i had my room upgraded due to overbooking and had a pleasant stay. the room was clean and spacious and it got a nice view from the terrace. 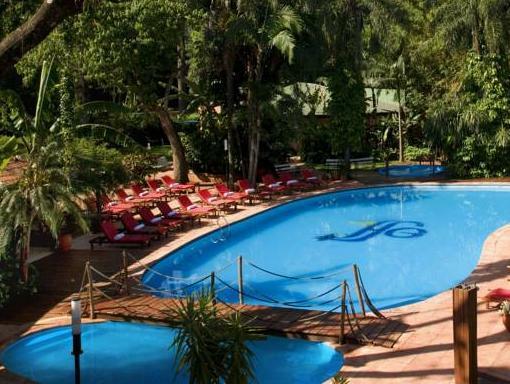 the hotel is located nearby the major bus station and provides easy access to iguazu national park. Nice pool and lounge area. we were very happy with this hotel. it was an ideal location for our visit to iguazu falls as the bus terminal is right around the corner. Location right at bus terminal and within easy walk of town. The location is ideal for visiting the Falls and spending a couple of days in Iguazu. The breakfast buffet was excellent, especially the enormous selection of breads. We ate dinner one night in the hotel, which was a very good buffet accompanied by a tango show. good location and very friendly stuff. nice swimming pool. Location. Outdoor pool and bar. Great location close to the bus station and minutes walk from the restaurants and bars of this superb town. The outdoor pool is huge and perfect for a swim and a relaxing beer in the afternoon. The hotel is well-maintained and the staff are friendly. Breakfast is good, but the coffee could be improved. The Saint George is around the block from the bus station for trips to the falls so it is very convenient for early morning starts when it is best to see the falls before the hords of large tour groups start to arrive and it gets very hot. It rained heavily as we arrived and the pool was wonderful for sitting in and swimming as the rain came down around us. The next day after the falls it was wonderful to have a swim on a hot sunny afternoon. Breakfasts are good and the room was quite spacious and comfortable. Overall a very good experience. Right across the street from bus station which offers 5 peso rides to the park. Helpful lobby staff - good restaurant recommendations. Overall a decent hotel for the price and very conveniently located to the bus station which offers inexpensive rides to the park. The staff are friendly and helpful, and madhe us a great restaurant recommendation. Would recommend this hotel if using as a brief launching bad to the park. For longer stays, and to the extent you are looking for true 4 star quality, you may try elsewhere. Great location, located just opposite to the main bus terminal and can easily get a bus to see the falls. The room is reasonably clean and it is also quite spacious. The hotel staff are friendly, but would be better if more staff are available as we almost need to queue every time we were at the front desk. It is a good idea to change Argentine Pesos there as the hotel gives a really good rate. The quality of the food in the restaurant was pretty normal, but well, there isn't many choices in the town as it is really small. Deluxe room spacious and well maintained.Bed extremely comfortable and large bath. Several restaurants along main street around the corner and local internet cafe about 3 blocks away. My friends stayed in standard room which was small. Also there was a nightclub across the street which was noisy until late at night. It kept me up as I am light sleeper. The hotel is across the street from the buses to Iquazu which saves you from taxis. After the Falls, the outside swimming pool with a bar is a great way of coming alive again. I was there in February which can be hot, but the Falls were well worth it. Best advise go as soon as Falls open and see Argentian Falls one day and the Brazilian the next day.